FloraNova represents a breakthrough in fertilizer technology, as it gives users both the strength of a dry concentrate and the ease of a liquid. This unique formulation of highly purified minerals and natural additives combines the benefits of hydroponic as well as organic gardening methods. FloraNova, one part formulation, combines all the elements required for hydroponic cultivation, plus it is extremely concentrated. A very small amount of FloraNova mixed with fresh water will provide your plants with proper nutrition. 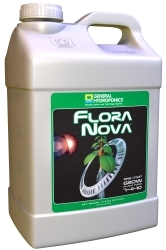 FloraNova works superbly in hydroponic environments, as well as with both soil-less mixtures and soil grown plants. Remember that due to its high concentration, FloraNova must be shaken vigorously before each use! The marriage of hydroponic & organic gardening methods. Outstanding for all plant types. Superb for Hydroponic, Soil-less, and Soil Cultivation. Super Concentrated and pH Stabilized. Optimum nutrient absorption from Natural Humic Extracts. How do I use the FloraNova Series? For hydroponics and aeroponics, mix FloraNova (Grow or Bloom, depending on plant phase) into reservoir or irrigation system to the desired ppm level (one to three teaspoons on average). For soil and soil less, media mix 1/4 strength solution of desired ppm each watering or full strength every third watering. When do I use the FloraNova Series? Use FloraNova nutrients throughout the entire life of the plant. What will the FloraNova Series do for my plants? The FloraNova series will provide a perfect balance of macro, micro and secondary nutrients that all plants need in one convenient bottle. Where will I see the results? Results are seen in the health, increased growth rates and increased fruit/flower production of plants grown using the FloraNova series. Why should I use the FloraNova Series? FloraNova is a convenient, liquid nutrient that gives extraordinary results. FloraNova requires no messy mixing and gives you back shelf space taken up by additional bulky bottles.